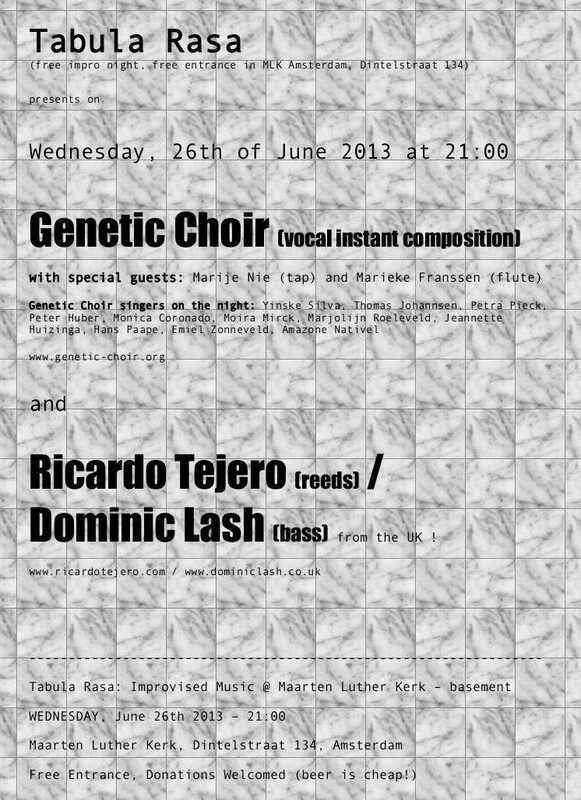 Genetic Choir workshop to start 2013/2014 season! 3 places still available as we speak. Times are 10:00-17:00 on both Saturday and Sunday, workshop fee is 110,- Euro excl. BTW / 133,10 total. Write us a message through the contact page if you would like to join. 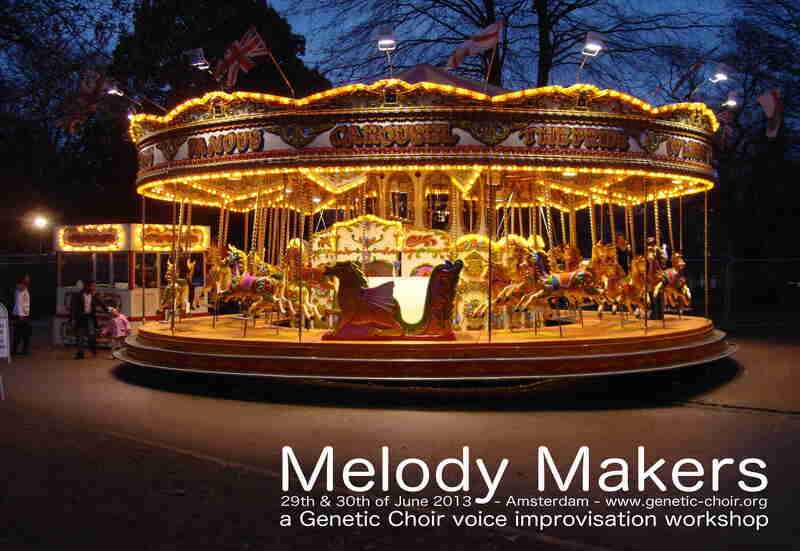 August 10, 2013 | Categories: improvisation, workshops | Tags: choral improvisation, group improvisation, improvisation choir, improvised singing, voice | Comments Off on Genetic Choir workshop to start 2013/2014 season! After yesterdays long and beautiful night with short, strange prose in Utrecht, we are looking forward to our Tabula Rasa concert, on Wednesday night in Amsterdam! I am a week late with posting this month’s musical offering of the Genetic Choir… Busy with creating the first Genetic Choir CD (!) which will be available at our concerts on 22nd and 26th of June. But for now: Listen below to this small, unassuming gem from our session archives. Melodies are the storytellers of music. Just start singing a few notes and instantly there is a feeling/atmosphere, the beginning and clear promise of a much longer story. 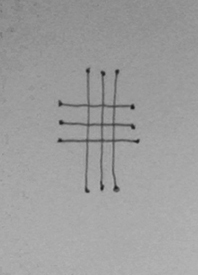 Melodies are also playful creatures, meaning that in bigger numbers they tend to swirl around each other, being looped and copied and transposed, creating ever-new relations and identities with each other, transforming to totally different music or ending in beautiful silences. In this Genetic Choir workshop, we look at how we use melodies in improvisation singing. Voice work and rhythm will feature along the way, but the focus is on weaving melodies and story. How do you go about it, as an improvisation singer? How do you make it personal and how does ‘meaning’ evolve? But also: how do you work together with other singers? The Genetic Choir approach ensures that you don’t need any particular background to be able to join this workshop. Any level of experience and/or musical styles are welcome. More information and inscription: Send a message through the form below. The Genetic Choir is publishing every first day of the month a new composition, drawn from our previous concerts and performances. Have a look at all the other music on our Audio Page. with the theme “Melody Makers”. Click here for more information.